I don’t know about you, but I love leftovers. 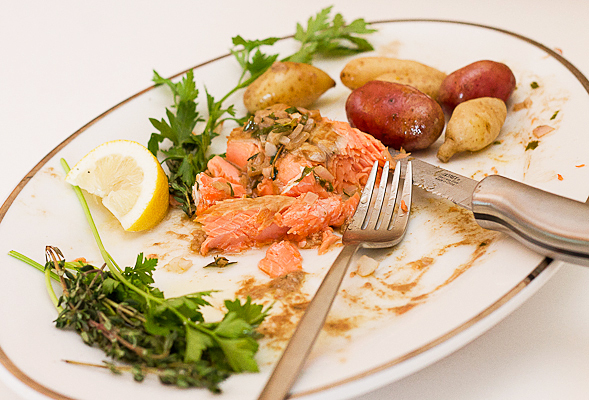 This recipe uses left over salmon and potatoes from my previous post One-Sided Crispy Salmon. Turning this into a breakfast omelette made for a satisfying and delicious meal. And when you serve it to guests, they won’t even know you’re using leftovers. The salmon, potatoes and herbs, along with the eggs were a prefect combination of flavors. I served it with a side of toast and some hot sauce. 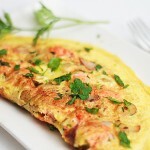 This would be a nice weekend breakfast, especially if you prepare my Crispy Salmon the night before. Only a handful of ingredients are needed and you’ll have delicious and healthy salmon for two days! This is our almost finished Crispy Salmon dish from last night! No guilt here. Heat pan with olive oil on medium-high heat. Stir potatoes in pan and cook until golden brown. In the meantime, scramble eggs and season with salt & pepper, then set aside. Add salmon and herbs to potatoes and mix. Pour in egg mixture and turn heat down to medium or low. Occasionally swirl pan so uncooked egg spreads and cooks through. Once cooked to your liking, fold one side over to create a crescent shape. Slide onto platter and serve with some toast and Sriracha or hot sauce, if desired. 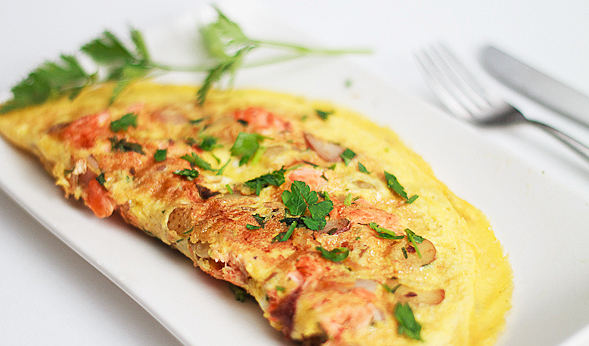 I love turning leftovers into omelets, too. Such a great way to re-purpose a meal! This really looks so light and lovely. Thanks, Carrie! I think it’s the perfect dish for a leftover meal.